A moving drama about the deep familial bond that develops between a 30-year-old man and his young niece after the girl's mother suddenly leaves town. Forced out of her home after her boyfriend is arrested, Joleen Reedy needs a place to stay with her 11-year-old daughter, Tara. She turns for help to her younger brother, James--a simple and overly trusting man who doesn't hesitate to welcome them into his modest rental apartment. Almost as soon as she moves in, however, Joleen hits the road with another man. Utterly ill-equipped to be the sole guardian of an adolescent girl, James does his best to make his distraught niece happy. But before long, things spin out of control: he loses his road crew job and Tara is put into foster care. Additionally, old wounds from his emotionally abusive and sometimes violent father begin to reopen as James is forced to re-examine his life. That's when James makes a fateful decision that will bring his life full circle and force him to face his demons. He takes off with Tara and the pair assumes new identities as father and daughter. What starts out as a ploy to evade authorities takes on a deeper significance as James strives to become the dad Tara never had, and for the first time finds a true purpose in life. 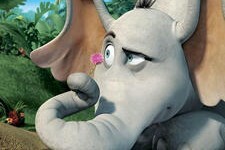 Horton Hears a Box Office Hit!